Recently on GRS I've been exploring the concept of motivation. But what if you didn't need to be motivated at all? What if you did what needed to be done automatically, without even thinking about it? You've probably heard a version of the saying before: We're creatures of habit. But what are habits, exactly? How are they formed? Why are they important? And how can we form good habits (or break bad ones)? Recently, I was listening to back episodes of the NPR program Fresh Air and came across a story on Charles Duhigg's book “The Power of Habit.” Duhigg has also written about how to change your spending habits for GRS. According to Duhigg, one of the reasons that habits are so powerful is that they are governed by a completely different part of the brain than decision-making. Why is this important? Because as has also been noted on GRS previously, making too many choices can result in decision fatigue and a loss of willpower. The more you can move your ability to complete desired activities over into the habit center of the brain (the basal ganglia), the more “room” is left in the decision-making center of the brain (the prefrontal cortex). In other words, if you can make an activity into a habit rather than a conscious decision, then you're saving your willpower for when you really need it. In his GRS article, Duhigg explains that, while most people focus on the habit itself, “habit loops” are actually a three-part process. The first step consists of the reminder (also called the cue or trigger). This is what lets your brain know that it can activate autopilot. The second step is the routine. This is what you actually do. However, for reasons that will become clear, it's helpful to think of the routine in connection with the trigger. For example, you brush your teeth (after your shower). Or you buy a coffee (on your way to work). Or you have a glass of wine (with dinner). The third step is the reward or reinforcement. This is where your brain decides that it's satisfied with what just happened and that it will continue to act this way in the future because of it. You feel clean, you delay the start of your workday and get a caffeine rush, you relax at the end of the day, etc. The key to forming a habit, then, is ensuring that all three parts of the process are present. It's not enough to focus on what you want to do/the habit itself. Additionally, since your willpower/motivation may crap out on you, they are insufficient for habit formation as well. You have to make sure that you're providing yourself with both a trigger and a reward if you want a new habit to stick. One easy way to find a reminder is to piggyback on a habit you've already acquired and use that as the trigger for something else. Let's say you're a caffeine addict; you could check your Mint account while you drink your morning coffee. Another, similar way to find a trigger is to piggyback on something that always happens to you. For example, you get paid every other Friday, so you can make your extra student loan payment when your paycheck gets deposited, before you've had a chance to spend that money. Finding a reward can be trickier. That's one of the reasons that piggybacking on an existing habit may make things easier. If you check Mint while you drink your coffee, you're using a reward your brain has already come to expect (caffeine) for another purpose. There are a couple of caveats when it comes to rewards. First, if your brain perceives the outcome of your routine as a punishment (making an extra student loan payment means you don't have that money any more), then it will be harder for the habit to form. That's why it's so important to know what motivates you. It helps you pick the reward that you will most enjoy, thus encouraging habit formation. Additionally, if you want to make something a habit, the reward for the activity can't be a one-off moment years down the road. 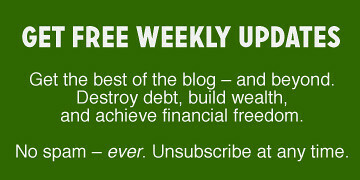 Knowing that in five years you'll be debt-free isn't going to help you create a habit. The reward has to be immediately experienced every time you complete the routine in order for the habit to stick. So in addition to picking a reward that you will enjoy, make sure it's easy, sustainable, and won't have any additional negative consequences. Eating a cake every time you pay a bill on time, for example, may encourage you to make your payments, but what good is that if you need to buy new pants every month? Breaking bad habits can be much simpler than forming new habits. Remember that habits depend upon triggers and rewards. This means that in order to change your routine, you need to remove at least one of those two steps. Removing the trigger is often the simplest way to break a habit. Do you find yourself shopping online after receiving a “daily deals” email? Unsubscribe from anything promotional, or even start a spam email account so that the deals are there when you want them but not triggering you when you don't. Identifying the reward your brain craves and finding another way to give yourself that reward may also help you break a habit, or at least modify the habit so it's no longer financially destructive. For example, I had a bad habit of buying cookbooks and not trying enough recipes to justify the expense. Turns out if I enjoy admiring recipes slightly more than cooking them, the Pinterest strategy gives me the reward I crave without spending money to acquire Stuff. Habit broken! OK, because there's a reward involved, maybe habits aren't entirely motivation-free. But by spending a little conscious effort up front to move your actions to the back burner basal ganglia, you don't have to think about those actions anymore. Seems to me if you can combine conscious and unconscious forms of motivation, you're well on your way to success! What habits do you have that help or hinder your ability to reach financial goals? What are your triggers? What rewards do you crave? Have you ever successfully created a new habit (or broken a bad one)? There are 19 reader responses to "Change is hard: Willpower versus habit". I learned about tying a goal to a trigger to help me accomplish it a few years ago. It does take a little bit of time to check off the three “boxes”. but it can be done. One note is that sometimes the reward isn’t immediately noticed. Take for example working out. I have started to walk for 10 minutes after each meal. I never see the benefit of this at the time. I had to dig deeper and take note to how I felt. Walking after eating makes me feel good and keeps my energy levels high. No more crashing after a meal! I’m sure where I read or heard it, but they say if you do anything for 3 weeks in a row it’ll now become part of your routine. For me that list includes eating, drinking and checking Mint. But I’m almost there with wearing pants. The research I did suggested the 3 weeks/21 times thing is an urban myth, repetition alone isn’t enough! You need the cue and the reward to make the habit. My input here, though, is to tell younger folks that, aside from our genetic blessings, I don’t know of anything more important to success than good habits. We might not be born with high intelligence, good looks, physical strength, that silver spoon, etc. I sure wasn’t. But good habits can overcome so many hurdles in life. I am here to tell you that I’ve many times seen habit help me achieve goals I wouldn’t have thought possible. This is one of the most important GRS posts of all. Good article. I don’t think we usually think about how our attitudes or thought habits influence our choices. You demonstrated well one of the keys to change in your recipe experience. It is hard to just stop any habit outright. Displacing it with some sort of substitution is powerful. I used to snack on really bad “foods” in the evening, M&M’s, Doritos, etc. I substituted a healthy food and broke the habit. It works, with diet and with financial choices. For example, I wanted to buy a canoe and my wife thought it was a waste of money. However, when I told her that I would do pushups and crunches every day for 30 days she agreed. I look and feel better, have a better habit of exercise, and a new canoe too! I was just wishing that my company had a 401k matching like my last one did, for this reason. Right now I have to make a conscious choice to save every month and it saps willpower I could have used for something else. I REALLY wish you guys wouldn’t capitalize “stuff.” It’s so gimmicky. While I am not a great fan of automatic payments, I do use them for my insurance and a few other regular monthly payments. Why not set automatic payments to a Roth IRA? I was addicted to diet drinks and chocolate chip cookies. My car would turn in at every McDonald’s it passed (no kidding–it was like the horse knew the way home). I had $2.14 in the ashtray. I substituted ice tea at first and ordered only 1 cookie. Then I quit entirely. Savings? Over $700 a year!!! Great article GRS. It is very timely since it has been on my mind as I am in the process of changing some of my discipline, habits and derive better results from my new venture> Day & Swing Trading. Trading is a performance skill most closest analogous to ‘Preparing for a Marathon’. Rewards and Mistakes parallel Wins and Losses, and it is fairly black and white for each step on WHY. Determining a Process leads to Forming a Discipline, and Practicing the Discipline leads to Forming the Habit. I have my Trading Manual written with a trading process, and I am in the process of making it a “habit” with a “checklist”. This (trading) is the hardest thing I have had to do relative to getting an engineering degree, working in a 20 year career, losing 59.6 lbs in weight and controlling my income/expenses to be debt-free more than 14 years ago. So, your messaging is hitting me between the eyes, and have been taking it to heart for a long time. Will also be passing it on to my “tweens” since they are on a similar mission of Strategy > Discipline > Habit > Results! Excellent post. I have heard about the book before. You did a great job of presenting it. thanks. Great and helpful article, with detailed advice and good examples. Thanks, Honey! This is exactly why I prefer the savings ratio of the Balanced Money Formula over the watching-every-penny with “gazelle-like intensity” of Dave Ramsey. Front-loading the decision makes it much easier to stick to it and produces less headaches. Take the savings from the top, pay all your obligations next, and whatever is left is yours to play with. It’s really that simple. Yes yes, every now and then your budget needs a thorough MRI, but not every day of every week of every month of every year. I rarely eat cookies. (I got over that craving years ago.) However, there are certain types of cookies I really like to eat, and when I need a strong incentive, I will go out an buy a box, then I don’t eat any until I’ve finished an important task (a recent example is getting my tax stuff ready for my accountant, which normally takes a week). So after spending an hour or two on the project each evening, I limit myself to three cookies. By the end of the week, I’ve finished my project and the box of cookies. Another way to take willpower out of the equation: the Pomodoro technique. Rather than having to figure out when to work and when to take a break, let your Pomodoro timer dictate your pace. The more you do it, the easier it gets. Builds up a great routine and the breaks are a reward in and of themselves. For certain tasks, instead of a timer I use customized music playlists to the same effect (fastfastfastfast/slow/fastfastfastfast/slow… etc). Great post! The brain is truly a fascinating thing. In her book Payback: Debt and the Shadow Side of Wealth, Margaret Atwood refers to the “jolt-of-brain chemical rush” that people get when they spend their way into debt. The good news is it can change. You say that debt-freedom in 5 years won’t cut it as an immediate reward to help in the formation of good habits, but I have found that I’ve experienced a transfer in my personal “jolt-of-brain chemical rush”. I now have it when we put money against our debt. And we are probably five years away from complete debt-freedom. So glad my basal ganglia is doing its thing! Prudence, you are right on. It is so important to realize how your mind is working either for or against you. It is indeed hard to focus on a goal that is five years ahead so you need to purposely look at something a little closer. One easy technique for most people when on the debt elimination phase is to focus on individual debts or groups: credit cards, automobile, or home, for example. It sounds like you are doing well. I assure you that becoming debt free is really worth the work. I would never go back! A habit that has helped me tremendously is transferring any money saved as soon as I can. I know it sounds easy, but sometimes, we’ll get a better rate on insurance and instead of moving that money we’ll keep it in checking. Though we have gotten better about having a buffer in the account we’re less tempted if it is transferred towards savings. We also get a better rate as it grows (not much, but a win is a win). Nice illustrations of Charles Duhigg’s excellent book – thanks. Yes, habit is a 3-part process as Duhigg describes. And “Motivation” is, perhaps, an ineffective place to focus.